The growing stem tips of Eurasian watermilfoil (and other milfoil species) are tassel-like and often red; especially early in the growing season. Tiny pinkish flowers occur on reddish spikes that stand several inches above the water and submerge when pollination is complete. The stem width of Eurasian watermilfoil almost doubles below the inflorescence. Lower flowers are pistillate, upper flowers staminate. Seeds are produced, but seedlings are rare in nature. In situations where water evaporates slowly and the plants gradually become stranded, Eurasian watermilfoil can develop into a land form. The leaves of the land form are smaller, stiffer, and have fewer divisions. If such plants are submerged, new growth with aquatic leaves develops in 7-10 days, but the first leaves formed have relatively few divisions and only later does the number of divisions increase to more than 12 leaflet pairs. 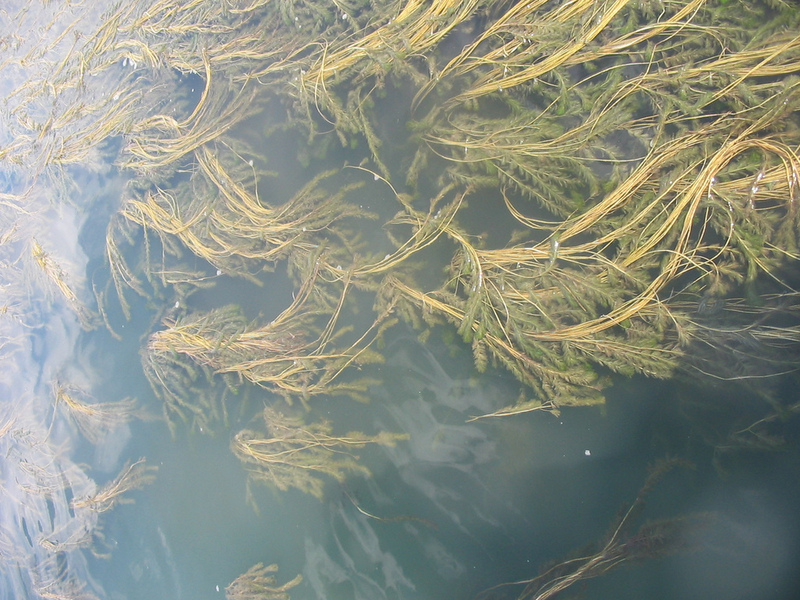 Eurasian watermilfoil is an extremely adaptable plant, able to tolerate and even thrive in a variety of environmental conditions. It grows in still to flowing waters, can tolerate salinities of up to 15 parts per thousand (half the salinity of Puget Sound), grows rooted in water depths from 1 to 10 meters (regularly reaching the surface while growing in water 3 to 5 meters deep), and can survive under ice.